Leisure World® of Maryland is a gated 55+ community in Silver Spring, Maryland. 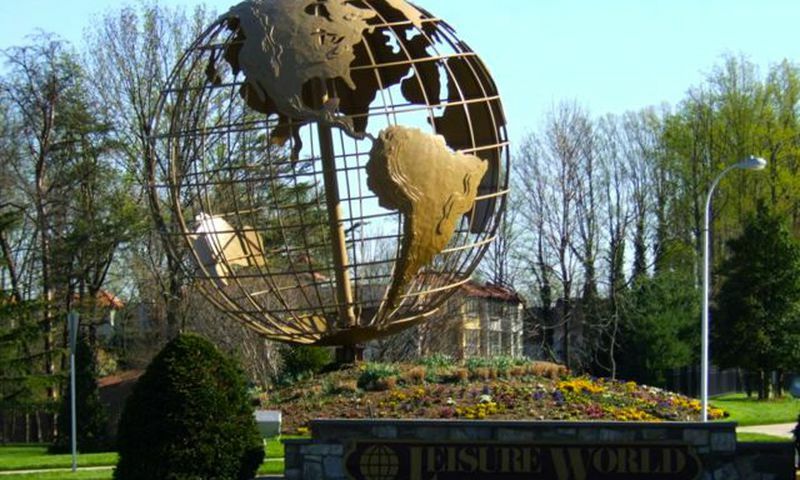 Leisure World® of Maryland is home to a wide assortment of world-class amenities. With two clubhouses, a golf course, and plenty social activities, there is always something happening at Leisure World® of Maryland. There are a variety of low-maintenance homes that include condos, attached homes, and single-family homes. Active adults are sure to find the perfect residence that fits their style and requirements. With snow removal and yard work taken care of, residents have more time to partake in as many clubs and events all year long. The community’s two clubhouses are the hub for social events, classes, and fitness activities. Clubhouse I has a library, woodworking shop, travel office, ballroom with a dance floor, three restaurants, and classrooms. Just outside of Clubhouse I you will find the outdoor pool, patio, and bocce ball and shuffleboard courts. The second amenity center, Clubhouse II, boasts a fitness center with state-of-the-art equipment, theater to view movies, auditorium for shows, meeting rooms, and an indoor pool. Indulging in your favorite hobbies is easy with the ceramics and lapidary studios readily available in Clubhouse II. Golf enthusiasts will love having access to the Leisure World Golf Course. This 18-hole championship golf course is complete with a driving range and putting green. The Leisure World Golf Course even has lockers, golf cart rentals, and a pro shop. With mixer events, tournaments, and lessons there is something for every golf fan. Throughout the 650-acre community, residents can enjoy the trails, gardens, parks, and gazebo. What sets Leisure World® of Maryland apart from other 55+ communities throughout the area is that they have a post office, bank, pharmacy, and medical center within their gates. Residents can even choose from two different houses of worship to attend service or use the community transit to travel outside of the community. Construction of Leisure World® of Maryland began in 1966 and in 2009 it was completed with a variety of low-maintenance residences. There are approximately 5,600 homes within the community that are subdivided into 29 neighborhoods, referred to as Mutuals. Some Mutuals consist only of condo buildings while others combine all home styles. Condos throughout Leisure World® of Maryland are located in both low-rise and high-rise buildings. They offer approximately 940 to 1,605 square feet of living space with one to three bedrooms, one-and-a-half to two-and-a-half bathrooms, and an assigned parking spot. There are many styles of attached homes throughout Leisure World® of Maryland as well. These homes range from approximately 650 to 1,450 square feet with one to three bedrooms, one to two-and-a-half bathrooms, and a garage or parking spot. While the majority of attached homes are single-level with a garage some offer a second floor. Homebuyers looking for a residence that is more private yet equally carefree will enjoy the patio homes. The patio homes are single-family homes that range in size from 870 to 1,200 square feet in size. These homes offer two to three bedrooms, one to two bathrooms, and an attached two-car garage. Leisure World® of Maryland has an Education and Recreation Department. The staff manages the community’s facilities as well as assisting in organizing fun activities and classes throughout Leisure World® of Maryland. The community is home to over 60 clubs and activities that cater to a wide range of interests. Whether your hobbies include crafts, fitness, or socializing there is something for everyone at Leisure World® of Maryland. You can explore your creative side by joining the art guild, short story group, or ceramicrafters club. There are many clubs that revolve around cards and games including bridge, bingo, chess, pinochle, and more. Music and theatrical groups offer clubs like amateur radio, comedy and humor club, music lovers organ club and ballroom dance. There are religious groups, cultural clubs, and political organizations that meet on a regular basis as well. Leisure World® of Maryland in Silver Spring is situated in the heart of Montgomery County. This attractive community offers its own shuttle bus to transport residents to the area’s shopping and entertainment. Downtown Silver Spring is home to many theaters, cinemas, and art galleries. There are even numerous historic sites, parks and plazas, and restaurants. This active adult community boasts a peaceful environment 30 minutes away from Washington and 40 minutes away from Baltimore. The community is also within minutes from the Metrorail making commuting to the D.C. area a breeze. Leisure World® of Maryland is the ideal setting for active adults and retirees who want to live in a thriving environment. Residents can enjoy the following amenities that are found throughout the community. Residents can purchase a membership to enjoy these golf amenities. There are plenty of activities available in Leisure World of Maryland. Here is a sample of some of the clubs, activities and classes offered here. Condos throughout Leisure World of Maryland are located in both low-rise and high-rise buildings. They offer approximately 705 to 1,790 square feet of living space with one to three bedrooms, one-and-a-half to two-and-a-half bathrooms, and an assigned parking spot. Leisure World of Maryland's attached homes range from approximately 650 to 1,450 square feet with one to three bedrooms, one to two-and-a-half bathrooms, and a garage or parking spot. While the majority of attached homes are single-level with a garage some offer a second floor. The patio homes are single-family homes that range in size from 870 to 1,200 square feet in size. These homes offer two to three bedrooms, one to two bathrooms, and an attached two-car garage. We bought a place here in August. We enjoy the neighborhood very much. I like to walk the dog along the pathways through out the community. It is relaxing and healthy, and beautiful! We only come here occasionally because our children are near and it allows us to connect with them often. If you enjoy being involved in lots of activities and staying busy you'd love living here. Ed and I moved to Leisure World last summer and our new life here is anything but Leisurely! We are very active in different clubs like bingo, bridge, tennis, gardening, reading, woodworking, golf, you name it! We've tried lots of new things and have met some wonderful people here. We are especially grateful we've found opportunities to do volunteer work and give back to our community. The community here has everything you could need, even a post office, the bank and a pharmacy as well as a couple churches. We rarely need to venture out to town but even when we do there is always a friend to go along for the ride, just to keep you company! We really like living here. 55places.com is not affiliated with the developer(s) or homeowners association of Leisure World of Maryland. The information you submit is distributed to a 55places.com Partner Agent, who is a licensed real estate agent. The information regarding Leisure World of Maryland has not been verified or approved by the developer or homeowners association. Please verify all information prior to purchasing. 55places.com is not responsible for any errors regarding the information displayed on this website. 55Places.com is in no way affiliated with the developer of Leisure World Maryland. The information you submit is distributed to the Community Adviser. The information regarding Leisure World Maryland has not been verified or approved by the developer. Please verify all information prior to purchasing. 55Places.com and the developer are not responsible for any errors regarding the information displayed on this website. Leisure World&amp;amp;amp;amp;amp;amp;reg; is a registered trademark owned by RRLH, Inc. 55 Places, LLC and www.55places.com are authorized by RRLH, Inc. to use the Leisure World&amp;amp;amp;amp;amp;amp;reg; service mark.